It is still very early in the morning and I have been up now for hours. This is Thanksgiving Day and my family from all over is already here. They arrived yesterday and last night. Three of my kids are here, their significant others, and two grandkids, Emma and Iris. My daughter Iotis and her family are celebrating today, but a couple of hundred miles south, and we wish them all well. Otherwise, this is it: my family. I (and we) have a lot to be thankful for this, as we do, every year. I am not much of a holiday person. Since I am retired, a holiday is a day off from a year of holidays – hard to measure. What I can measure is when the family assembles. A holiday for me wherever any of my family assembles. This means everything. I am grateful to still be on the planet, to still be married to a wonderful woman, to have four healthy kids, their partners, seven grandkids, and a dog that is precious to me. This year I am especially thankful that little Iris is fast recovering from a very difficult operation. Iris and I laughed together last night and I watched her dad, Seth Bernard, sing songs to her while she tried to sing along. I am told that Iris, like her granddad, loves Jazz. She especially loves Stan Getz and his bossa-nova years; who doesn’t? And my granddaughter also Emma got here last night. I have not seen her yet because she was asleep in the car when they arrived (and got carried in), but as soon as it gets light out (or before) I will hear those little feet heading for my office. Grandpa and Emma are good friends. Here is a photo I took just minutes ago. You can see three casserole dishes holding my famous stuffing, ready to go into the oven later today. 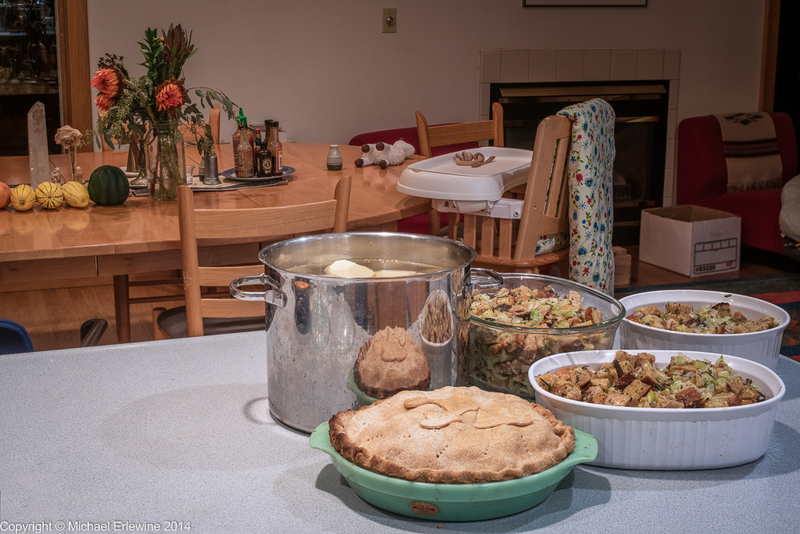 The pot on the left is filled with peeled potatoes for mashing and gravy. And last, but not least, here is an apple pie that Margaret made yesterday, one of four pies, two apple and two pumpkin. Of course there will be all kinds of other stuff, like fresh organic cranberries with zest, Waldorf salad, cheeses, peas (of course), and on and on. After dinner it is coffee, pie, and whipped cream. I am grateful to be surrounded by loved ones and I wish each of my Facebook friends the very best and happiest Thanksgiving Day.